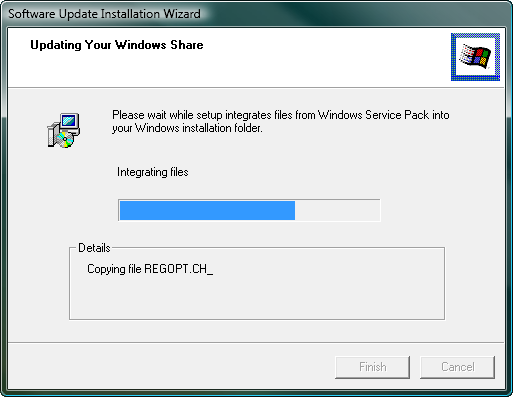 This guide will take you through the steps in slipstreaming the latest service pack into Windows XP and burning it to a disc. Please note: It has come to my attention that you can't use the '/integrate' switch to slipstream SP3 (into the volume licensing edition anyway) unless you're actually doing so within XP/2003 (i.e. it won't work if you're running Vista or newer) - Read Microsoft's KB article 950722 for more info. 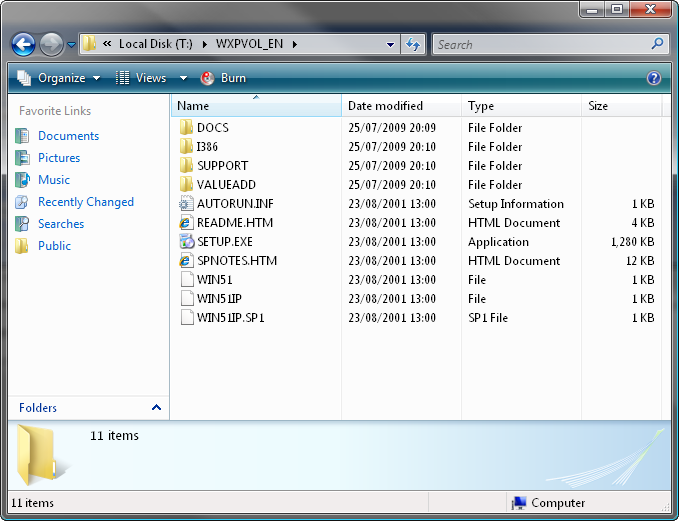 Start by creating a folder on your hard drive and copying the entire contents of your original XP disc to it (just drag+drop it all using Explorer). 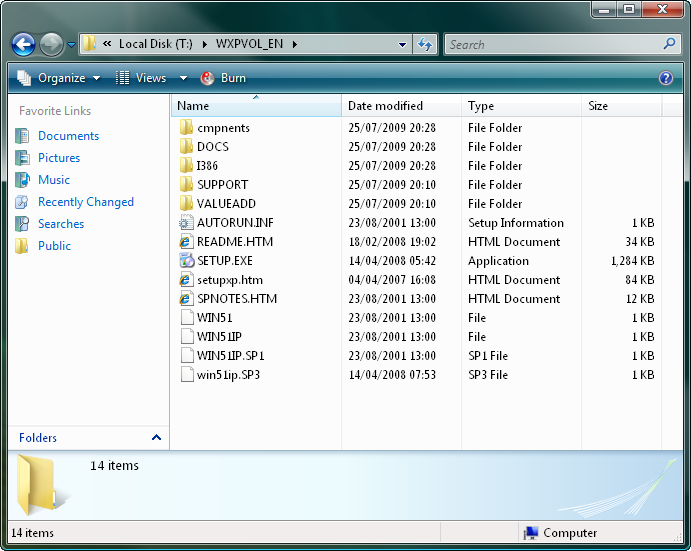 In this example, I'll use a folder called 'WXPVOL_EN'. Download SP3 from Microsoft's website. 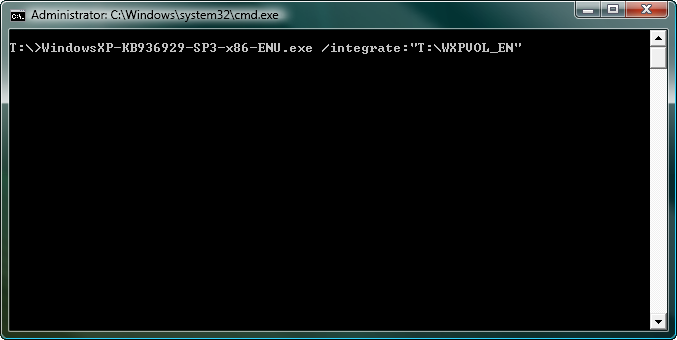 I ended up with a file called 'WindowsXP-KB936929-SP3-x86-ENU.exe'. Now bring up a command prompt window and run the following command - changing the target directory where appropriate. All being well, it'll then start to integrate itself into the folder. 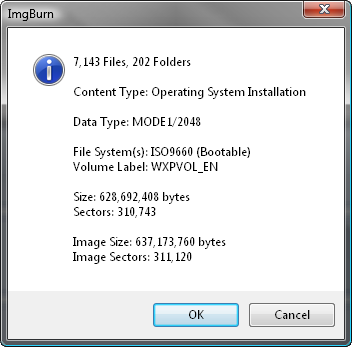 That's it, we now have a nice set of source files for burning a Windows XP SP3 OS installation disc. 2. Click the 'Write files/folders to disc' button. Note: This is basically the same as switching the 'Mode' to 'Build' and setting 'Output' to 'Device'. 3. 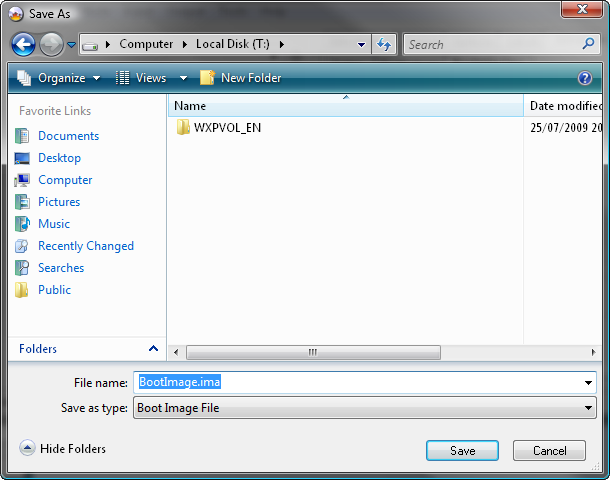 Add the 'WXPVOL_EN' folder to the 'Source' box. 4. Switch to the 'Advanced' tab, and then to the 'Bootable Disc' one. 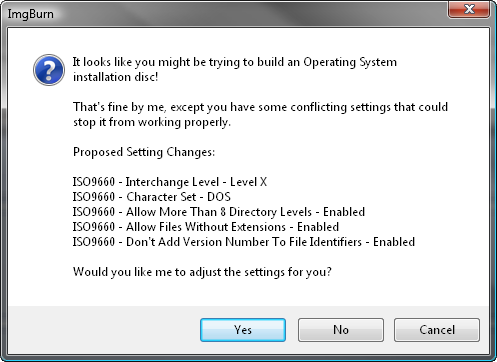 If you have your original XP install disc, proceed with step 4.a. If you don't, proceed with step 4.b. 4.a. Select the drive with your original XP install disc in it and click the 'Extract Boot Image' button. Pick a destination folder and name for the file and then click the 'Save' button. 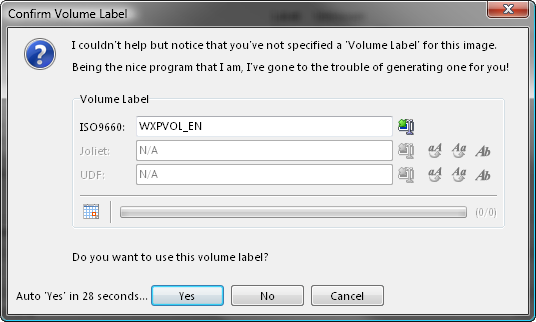 Make sure you don't save it in the 'WXPVOL_EN' folder! Click 'Yes' to save yourself some time! 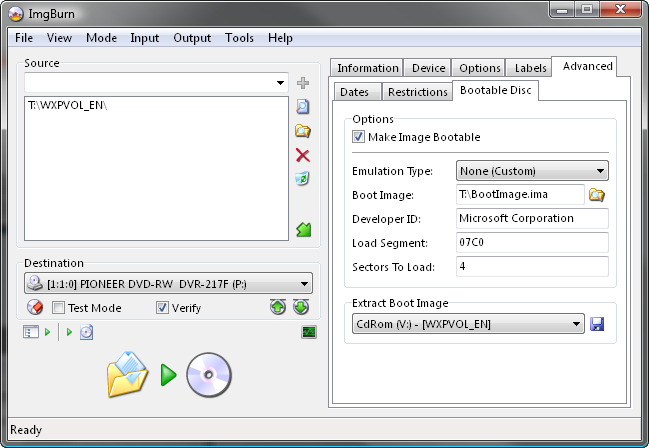 You should then notice the fields at the top of the 'Bootable Disc' tab have been filled out. Now proceed with step 5. 4.b. 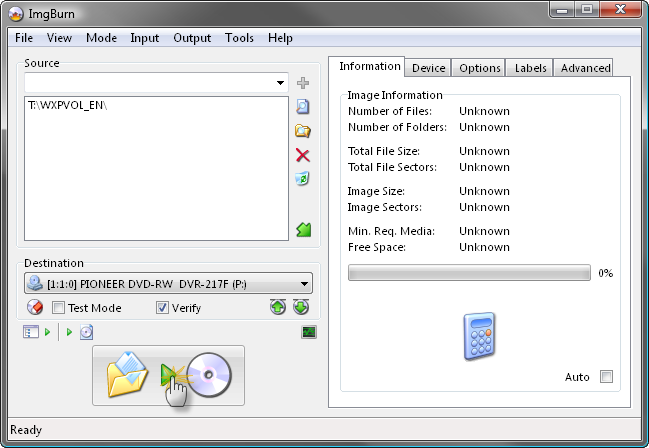 Using the boot image attached below, extract the zip archive to your hard drive. 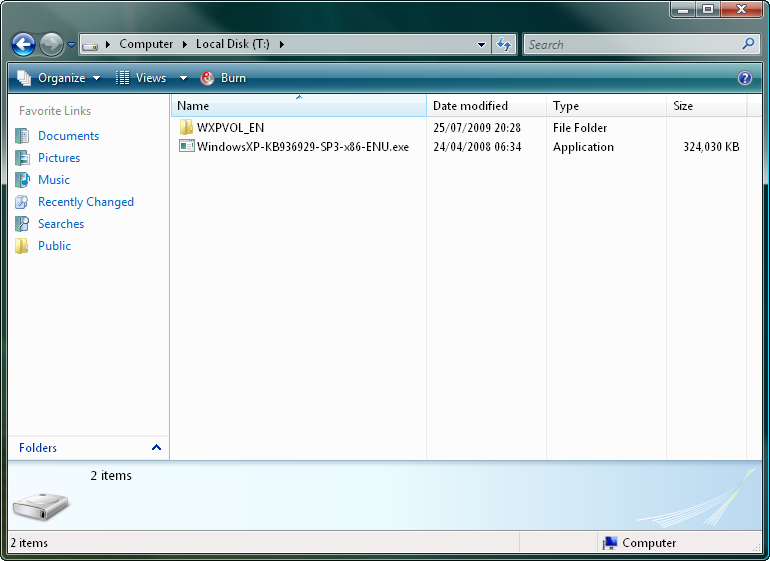 The parent folder of the 'WXPVOL_EN' folder would be an ideal location (i.e. in this example, T:\). Make sure you don't extract it to the 'WXPVOL_EN' folder! 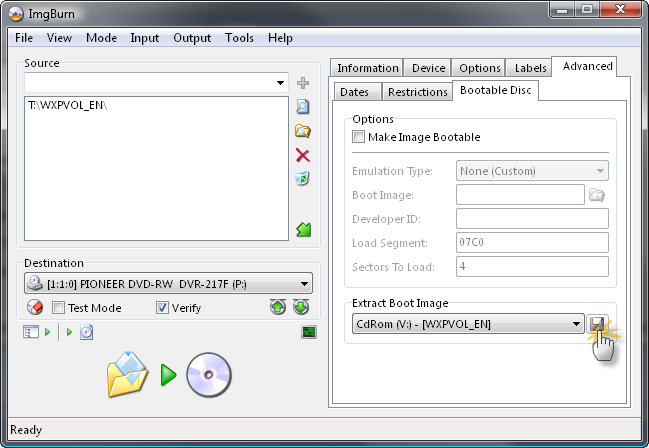 Now enable the 'Make Image Bootable' option and configure the settings as shown below - using the correct path for the 'Boot Image' of course - only you know where you extracted it to! 5. Insert a blank (or erasable) CD/DVD disc in your burner. Note: The message in the status bar should now say something along the lines of 'Ready'. 6. Now we're ready to burn so click the big 'Build' button! Assuming your source folder is in order (i.e. 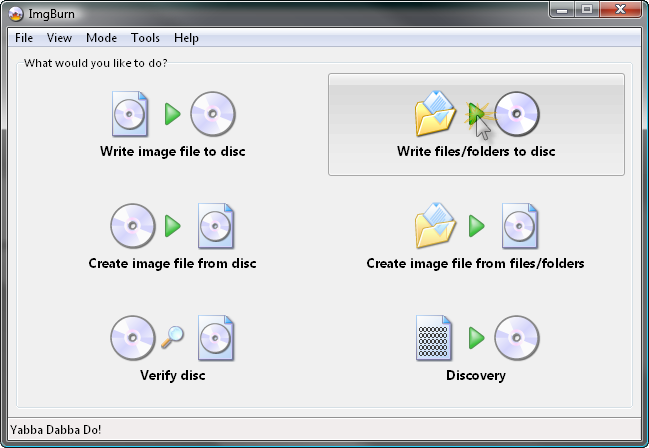 it contains an I386 folder) and depending on your current settings, the program will prompt to correct certain things so they match (as closely as possible) an official Microsoft disc/image. Click 'Yes' to whatever it says needs correcting - these settings have been tried and tested so we know they work! 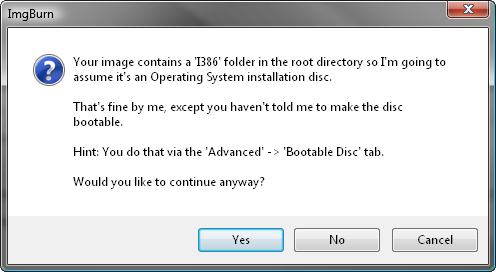 Note: If you haven't completed the 'Bootable Disc' tab properly, you'll get the prompt below. Do NOT click 'Yes' to that one! 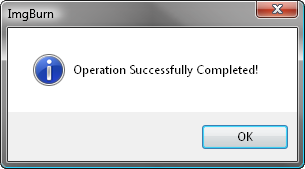 Instead, click 'Cancel' and correct the problem as per step 5 above. Once everything has been checked and tweaked (and assuming you haven't already filled it out on the 'Labels' tab) you should be prompted to enter/confirm a volume label for the disc. I'm happy to accept the default value here - which has been generated from the name of the folder we added to the 'Source' box earlier. 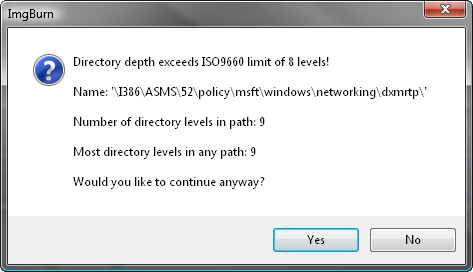 If you then get a prompt about directory levels, just click 'Yes' to continue anyway. You'll then be presented with one final 'information' screen before the program starts to burn the disc. Double check everything looks roughly as it does below and then click 'OK'.